Smoking at home by yourself can be less lonely with the help of Stoner Youtube vloggers. You can watch videos of them smoking and talking about weed-related topics while you spark a bowl of your own. SilencedHippie is a stoner chick who likes to go on stoned nature hikes. Along with her vlogs, you can find product and strain reviews on her page. She is 23 years old and a legal Rhode Island medical marijuana patient. The young hippie has got two plus years of experience making YouTube videos and her own tie-dye clothing business. She attends events like hempfest and hotboxes tents with bong hits. Her page is female friendly and she even hosts lady smoke seshes, pajama party seshes and more. Her username is SilencedHippie because at first she never showed her face due to a fear of what her friends and family might think of her habit. However, she wanted to share her enthusiasm and interest in weed with the world. She decided to keep the username because her channel grew in popularity and it ironically gave her a voice. Sasha is no longer afraid to show or be herself on camera. Strain central is a daily cannabis education and entertainment channel run by Josh from Washington State. Josh can be seen participating in smoke sessions and weed challenges on film. He also does strain reviews and live streams his stoned gaming on his twitch channel: straingaming. His youtube channel also features unboxing videos as well as product reviews. He’s quite energetic and speaks clearly for a stoned fellow, his channels definitely worth looking into. Joe Kid from Denver Colorado started the Crutch 420 channel. Crutch 420 is an “18+ youtube channel designed to keep adults and cannabis users up to date with everything happening in the wide world of weed.” On his channel Joe kid can be seen telling smoking stories. He also does cannabis-related tutorials, interviews, news, and more. Kimmy Tan is an eccentric tattooed deadlocked down to earth chill girl hailing from San Francisco, CA. She grew up in China and moved to the U.S. Kimmy Tan has been running her youtube channel since 2007. She’s gone from hair and makeup tutorials, to music videos, to a focus on weed vlogging. She is a medical patient who enjoys posting rolling tutorials, product reviews, unboxing videos and more. 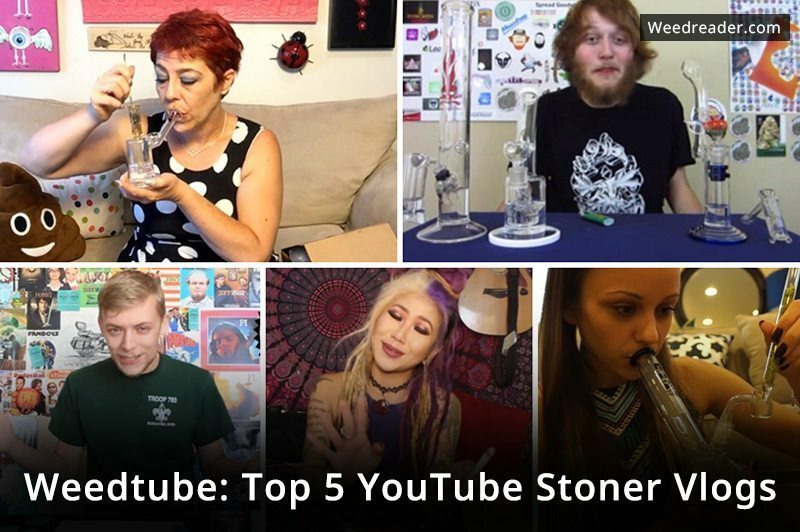 She’s got nearly 130,000 subscribers and she’s been making unique weed-related content for youtube viewers over the past two years. Did we mention she has a cat named dabs? She rolls insane joints/blunts that are huge in size, wrapped in wax, or rolled into crazy shapes. Her channel doesn’t only feature weed-related things although as of lately that’s been the main focus of her page.